Depending on the type of the Cerebral Palsy and Neurodevelopment Disorders, we will observe different patterns including positions and movements and different impairments. The symptoms and function of each person with Cerebral Palsy varies. Cerebral Palsy is non-progressive so does not get worse over time, but the exact symptoms and function can change over a person's lifetime. From Birth to 5 years of age, a child should reach specific movement goals or developmental milestones - e.g. rolling, sitting up, standing, and walking which are often delayed or absent in the child with Cerebral Palsy. Other impairments that children with Cerebral Palsy can develop are skin and digestion problems, motivation, nutrition and growth, deficit of attention, learning difficulties. You can read more about these conditions on the Physiopedia Page Cerebral Palsy Associated Conditions. The following information outlines many of the main neuromuscular, musculoskeletal, sensory and perceptual features you will see in children with quadriplegia, diplegia and hemiplegia. Child try to lift the head, so recruits excessive extension of mid-thorax with poor synergy between extensors and rotators cuff of the shoulders (Supraespinous, Infraspinous, Teres minor, Subscapularis: SITS), pectoralis, rhomboids and serratus anterior. This create a specific musculoskeletal feature. With the time and the effort of the kid to upright the head, pectoralis and latissimus dorsi contract bringing more and more the shoulder in extension and internal rotation. In consequence the biceps brachialis is unable to do an eccentric contraction, because the elbow cannot create a base of support in the epitroclea against the gravity and align with shoulder so this create the elbow flexion. The forearm pronators and hand flexors are not fully lengthened. Erectors of the lumbar spine and rectus abdominus muscles are easy to recruit because they are superficial. In fact these two muscle and the pectoralis are the ones to bring the centre of mass forward to maintain the sitting position. Impossible to rotate or dissociate Upper and Lower Limbs due to the difficulty to recruit Multifidus, Exterior and Interior Abdominal Oblique’s muscles. Huge contraction of Hip Flexor muscles, Internal Rotators, Adductors pulling hip into dislocation or malformation of hip joint. Tightening of Hamstrings pull pelvis into Posterior tilt. The Antagonist Muscles; External Rotators muscles (Gluteus Maximus, Medius and Rotators) cannot co-contract in synergy because of loss of alignment of pelvis and hips. So the muscles are not in the correct anatomical position to contract correctly. Nevertheless the flexors, hamstrings and adductors have longer lever arms that enable them to contract more than their antagonist. Head is sustained with asymmetrical hyper-extension, cervical spine is not elongated, not able to move in the 3 planes (frontal, sagittal, transverse) so often develops tightness in extensors and the loss of ROM in the upper cervical spine into flexion. Note: This pattern will correspond to a kid with a normal development of 1 month, but babies developing normally change this position by controlling the head with in 3 planes; extension, flexion, lateral flexion and rotation while pushing the surface against gravity. Hips in flexion, greater trocanter in anterior torsion and lumbar lordosis. Legs in internal rotation and feet in pronation, hindfoot in eversion, plantar flexion and forefoot in adduction. No binocular vision. The eyes are not independant from the movement of the head (like a normal child at 3 months) so perception of the environment is difficult. The jaw remains open (extension) and the tongue retracted, coordination between them is severely compromised. Due to this poor alignment of the oral structures they will have difficulties in feeding and sound production. Children with Quadriplegia have extreme difficulty using upper limbs, such as reaching out, grasp and release. Food: With a spoon and finely minced food. Children with diplegia have good head control. In prone shoulders are slightly elevated and in internal rotation. Cervical and upper thoracic spine is extended (elongated) and the lower thoracic spine is in a position of extension (not elongated), due to the difficulty to bring shoulders into flexion with neutral rotation and push up with elbow extension and with active abdominal holding, in consequences the lower thoracic spine does not actively extend. Lower thoracic extension is necessary to reach erect sitting and alignment for a efficient use of the weight shifting and freedom of upper and lower limbs. For diplegic kids this bi-isquiatic sitting position is difficult so they often sit in W-sitting, because it enables them to use their hips flexion, adduction and internal rotation positioning, thoracic and lumbar flexion and cervical hyperextension. W-sitting provides them a bigger base of support tan the long sitting, that’s why they enjoy it because they are able to manipulate. The facet joints at thoracic spine can rotate (transverse plane), but the facet joints in lumbar spine are stuck in the sagittal plane enabling only flexion/extension movements, that’s why they have a lack of pelvis dissociation (frozen pelvis). Hips are pulled to flexion, adduction and internal rotation, due to this diplegic manage to crawl with this pathologic pattern. Children with Diplegia manage to walk in a more or less functional way. In diplegic forms functional surgery generally is performed after the acquisition of upright position and walking. The most common skeletal problems are femoral intrarotation, tibia extratorsion and break down of talus-scaphoid joint with valgus adducted foot. From the visual point of view, gaze paralysis is quite common in diplegic children particularly convergent strabismus. Which worsens the pathological motor pattern, especially during locomotion (scissor pattern) and manipulation (eye-hand-mouth coordination). Start pulling to stand around 2 years old, independant walking around 3-5 years but they are not able to deal with stairs until 5 years, however due to secondary deformities they have early fatigue and poor motivation, the more severe cases give up walking at beginning of adolescence. Lower limb independence dressing is difficult. Reach quite satisfactory manipulation competence, especially in sitting position, apart from those cases in which there is also dyskinetic elements present. 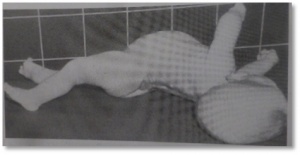 Child with hemiplegia shows subtle asymmetries in supine position in the 2nd trimester, hemiplegic arm remains in shoulder elevation and extension. Children with hemiplegia sits in the non-affected side, so they remain in a shortened position of the paretic trunk side and avoid weight bearing in hemiplegic side. Many children use this posture to scoot about the floor, totally avoiding an all-fours posture. All fours requires a more symmetrical trunk and extremities weight bearing that are difficult for hemiplegic kids. That’s why most of hemiplegic do not crawl, they use to move around using lateral sitting posture. When they grow the hemiplegic trunk side is shortened as the cervical spine in early stages. Upper limb remains in protraction, elbow in flexion and hand close, maybe thumb adducted. This create big difficulties to integrate the hand in ADL activities. However, there are postures that remain in the 3 different walking patterns. One is the pelvic asymmetry in the 3 planes. In the frontal plane the pelvis is elevated (craneal tilted) in the transverse plane the hemipelvis of the hemiplegic side is rotated posteriorly, in the sagittal plane hip is in flexion. The leg remain in internal rotation, knee in flexion and plantar flexion. Functional leg length discrepancy, showing the hemiplegic side shorter because hemipelvis is elevated. In fact it might be true bony size discrepancy due to growth. This happen in stiff kids with severe hip and knee flexion, adduction and internal rotation. The shorter leg tends to follow with internal rotation, plantar flexion and inversion with strong pull of tibialis posterior. The hemiplegic foot supinates with weight bearing. Other type are the hemiplegic with less hip flexion and less internal rotation but knee hyperextension with weight bearing and plantar flexion, although the first contact in stance phase is with toes not with heel. Hip in external or internal rotation, knee mobile with phases of flexion and extension and slight plantar flexion with pronation of foot. Kids with neuromuscular stiffness. Muscle retractions and early or late bone growth alterations are more or less frequent according to the severity. Tactile, thermal, pain, proprioceptive… occur more in adults is not frequent in childhood hemiplegia. Although stereognosia disorders are quite frequent. Motor impairment, perceptive alteration, neurophysiological aspects, epilepsy are all factors that affect direct with the child learning ability. ↑ 4.0 4.1 4.2 4.3 4.4 4.5 4.6 4.7 Stamer MH. Posture and Movement of the Child with Cerebral Palsy. 2015. ↑ 5.0 5.1 5.2 5.3 5.4 5.5 5.6 5.7 Shepherd RB. Cerebral Palsy in Infancy. Elsevier Health Sciences; 2013 Sep 20. ↑ 11.0 11.1 Ferrari A, Cioni G. The Spastic Forms of Cerebral Palsy. Springer; 2010.